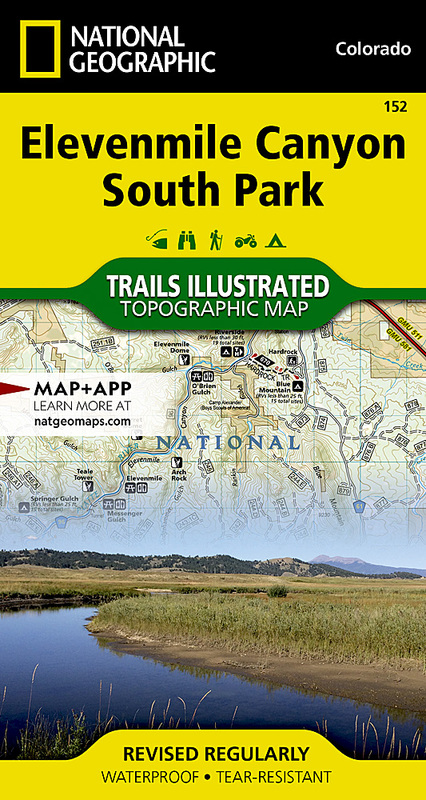 Outdoor enthusiasts seeking the year-round recreational activities in central Colorado will marvel at National Geographic's Trails Illustrated map of Elevenmile Canyon and South Park. Created in cooperation with the U.S. Forest Service, Colorado Parks and Wildlife and others, this expertly researched map covers, with unparalleled detail, the area from Lost Creek Wilderness in the northeast to the city of Salida in the southwest. Some recreation hotspots pinpointed are Pike and San Isabel National Forests, Spinney Mountain and Elevenmile State Parks, James Mark Jones State Wildlife Area, Platte River and Antero Reservoir. Whether your exploring on foot, horseback, bike, motorcycle, ATV or snowmobile, find suitable trails to lead to you off the beaten path and back on again. Trails are mapped with mileage markers between intersections. Your navigation will be aided by the map's contour lines, elevations, labeled peaks and summits, water features, a full road network (including Forest Service roads and scenic byways) and clearly designated areas of public and private land. Some of the recreation feature are trailheads, campgrounds, public cabins, interpretive trails, climbing areas, boat ramps, whitewater access points, fishing areas and potable water. A camping guide lists campgrounds in the Elevenmile Reservoir and Canyon areas along with their amenities. Other features found on this map include: Antero Reservoir, Elevenmile Canyon Reservoir, Lost Creek Wilderness, Middle Fork South Platte River, Pike National Forest, Puma Hills, San Isabel National Forest, Thirtynine Mile Mountain, Waugh Mountain.